This brand new Industrial Grade Digital Ultrasonic Cleaner has powerful transducer, heater and large tank capacity for superior cleaning results, making it great for professional cleaning. It uses digital program in ultrasonic cleaner to control the unit. According to the quantity and condition of the items to be cleaned you can choose a suitable working cycle. It is used to clean a wide variety of instruments and mechanical parts such, returning them to almost "like new" condition without damage to delicate parts. As a result, it is more convenient and the cleaning results are more remarkable. Don't hesitate to add it to your cart! Ultrasonic Frequency: 40kHz Power cord length: 70.9"
【Multi-Function】Our professional ultrasonic cleaner is designed for home or commercial use for jewelry, personal items, dental instruments, lab items, PCB, gun parts, precision part, tableware, or children and baby items. 【Easy Operation】Simply fill the stainless steel tank with water, put your items inside, set the time, adjust the mode, then you will see your items looking brand new again in minutes. 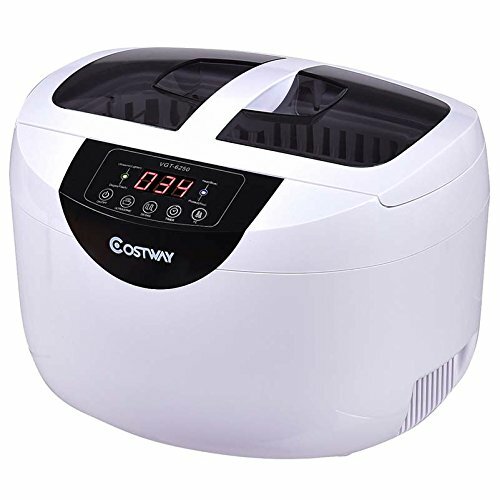 【Large Capacity】This ultrasonic cleaner can hold 85 oz (2.5L) items with interior dimensions of 11.7"L×9.1"W× 8.2"H, which allows you to fit a wide assortment of items into the chamber for cleaning all at once. 【Safety Protection】When the ultrasonic cleaner is overheated, it will shut off automatically to keep you and your family members' safe all the time. 【Shipping & Customer service】UPS or USPS will deliver the item to your house in 3-6 business days after you placed an order. We packed the item as good as we can, if there is any damaged part, please contact us first and offer us pictures of damaged part, we will solve the problem as the way you want(discount or replacement).